Diabetic retinopathy is damage to the retina resulting from Diabetes Mellitus. Either Type 1 or 2 can cause diabetic retinopathy. Diabetes damages the retinal blood vessels, which can lead to bleeding and swelling of the retina. There are two types or stages of diabetic retinopathy: (1) Non-proliferative diabetic retinopathy (NPDR), which occurs first; (2) Proliferative diabetic retinopathy (PDR), which is the more advanced and severe form. The rate of diabetes is rising and diabetic retinopathy is the leading cause of blindness in working age Americans. Retinopathy is more likely to occur earlier and be more severe if diabetes has been poorly controlled. 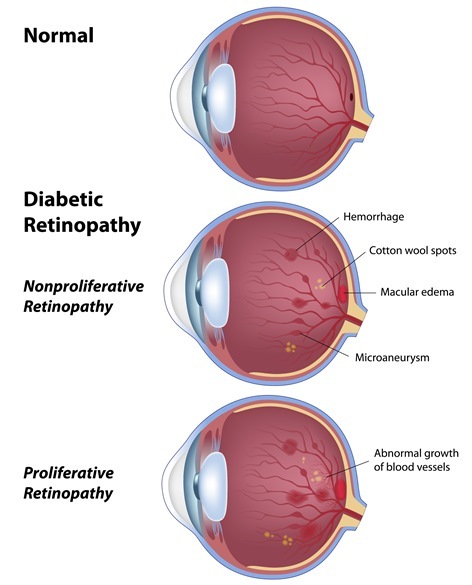 After 20 years of diabetes, 99% of those with insulin dependent diabetes and 60% of those with non-insulin dependent diabetes have some degree of diabetic retinopathy. Floaters due to bleeding inside the eye, which can occur without any prior symptoms. Many people with early diabetic retinopathy have no symptoms before major bleeding occurs in the eye. This is why everyone with diabetes should have detailed retinal examination at least once a year. Factors affecting diabetic retinopathy: (1) Control of blood glucose, blood pressure, and cholesterol; (2) Stop smoking. Once you are diagnosed with early diabetic retinopathy, you should be closely followed by an eye doctor with good experience in retinal exam. Currently, there are two major in-office treatments for diabetic retinopathy: (1) laser treatment of the retina and (2) intraocular injection of medicine. These treatments are usually performed by a retinal specialist. The treatment prevents the diabetic retinopathy from getting worse. Treatment can also sometimes reverse some damages and improve vision. Severe diabetic retinopathy can lead to vitreous hemorrhage or retinal detachment, which requires a surgical procedure called vitrectomy.